Joe Peck, with his son David, milks 100 registered Holsteins at Peckhaven Farm, a Dairy of Distinction, near Saratoga Springs, New York. 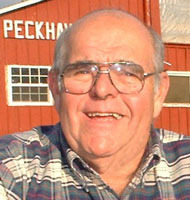 Joe wrote a humorous column “Peck’s Peckings” for eight years in the American Agriculturalist magazine. A member of the National Speakers Association and Toastmasters, Joe feels that his greatest accomplishment is convincing his wife that he doesn’t have time to mow the lawn, but always has time to go to an auction. Joe has been entertaining audiences for years with a combination of enlightened inspiration, homespun yarns and stand-up comedy, drawn from a lifetime of farm experience. He is the author of two books: A Cow in the Pool & Udder Humorous Farm Stories, and A Tractor in the House & Other Smashing Farm Tales. Programs: Farm Stories, Country Stories, Stories of Childhood on a Dairy and Fruit Farm.